It's been a good year here at Tired of London HQ. 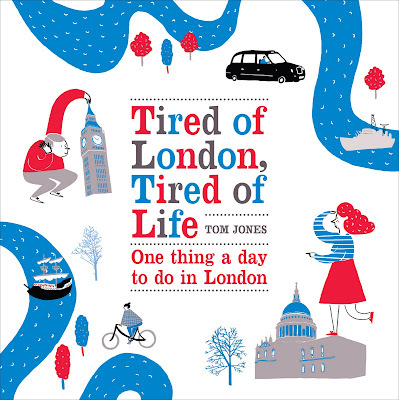 Your author has managed to think of a thing to do in London every day since the 3rd of January, and has managed to build up a respectable number of visitors through his vague ramblings about our capital. Tired of London, Tired of Life has even had a baby, inspiring an unknown student in Brighton to begin Bored of Brighton, which follows the same formula as this site. Your author wishes her good luck with that, on the proviso that it does not become more successful than this site! The New Year will hopefully bring fresh flashes of inspiration for your author, who is moving to a new home back within the boundaries of Hackney, London's greatest borough. This will undoubtedly continue to insire Hackney-centric posts, but your author will continue in his attempts to cover the whole of the area inside the M25. Your author would like to thank all the great London new media giants he has met this year, who have helped with their work to inspire this site. Particularly everyone at Londonist, Daniel from Twitter.com/LDN, Jane from Jane's London, as well as Ianvisits, 'John Bull' from London Reconnections, Annie Mole, Brian the Pigeon, Caroline's Miscellany and many, many more whose names escape him. 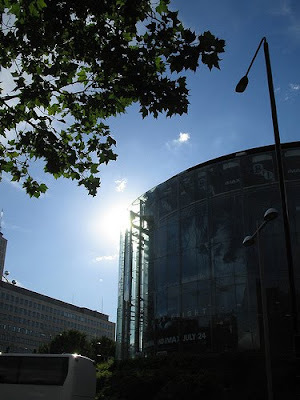 There are a lot of big budget films around at the moment which suggest you watch them on a big screen, in 3D, and there is no better place in London to do this than the BFI Imax in Waterloo. Completed in 1999, the cinema has the largest screen in the UK at 20m by 26m, and a seating capacity of around 500. Avatar is probably the big draw at the moment but it is pretty much booked up for a while. Never mind, however as there are other films on offer and the trailers look a bit rubbish. It's been pretty cold recently, and it's been Christmas, so spare a thought for poor old Brian Haw, who has been sitting out in his tent on Parliament Square since 2001. Annoying as many of your author's Westminster friends understandably find his incoherent megaphone shouting, you have to admire his staying power, especially at this time of year. A former boat-builder, Merchant Seaman, removal man and carpenter, he set up his camp as a one-man political protest against war and foreign policy, and has adapted it to take in almost all of foreign and some domestic policy since. Still, he's survived many attempts to move him and as long as he's enjoying it, you might as well give him a wave. 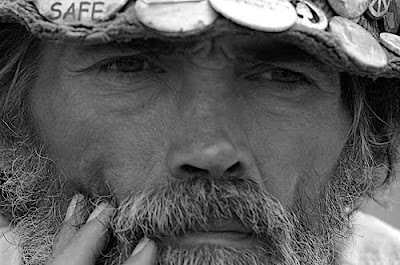 For more on Brian, see http://en.wikipedia.org/wiki/Brian_Haw. 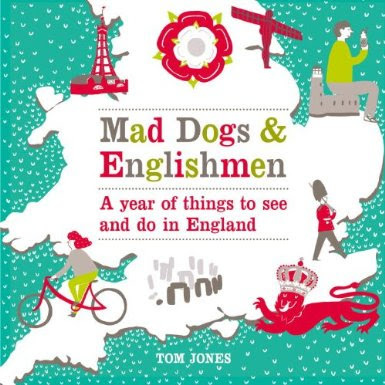 Your author is a big fan of the Thames path, especially by bike, and whilst researching some things to do for a reader the other day he stumbled across a great-sounding short walk available on the internet courtesy of the AA. 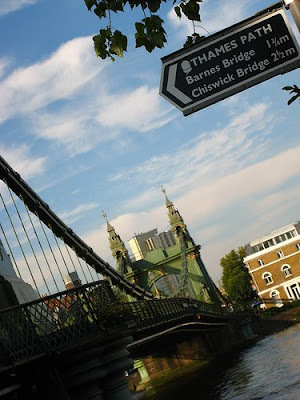 Beginning and ending at the Barnes Wetland Centre, it takes in Hammersmith Bridge and Barnes Bridge and takes in a beautiful part of the river and some nice pubs along the way. The walk is only 3.7 miles, is rated as easy and should only take about an hour and a half. If this sounds like your sort of thing, pull on your walking shoes on your next day off and head on down. 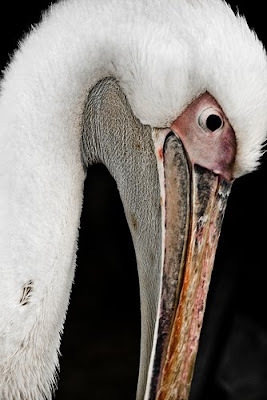 Nowadays most famous for eating pigeons, pelicans were first introduced to St James' Park in 1664 as a gift from the Russian Ambassador to Charles II, when they were described by John Evelyn, a contemporary of Samuel Peyps as "a fowle between a stork and a swan". Five pelicans still live there today at the Easterly end of the lake near Duck Island, and are so much a part of the Westminster Village that they have even been the subject of debate in the House of Lords. 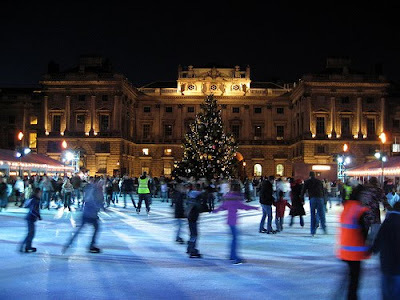 This year the ice rink celebrates its 10th birthday, and if you don't fancy it today, it's open all the way until 24 January 2010. Opening hours are rather erratic, but the rink is open most evenings and there are even DJ Nights, student events and early morning Breakfast with Tiffany specials. Whilst the rest of us are slacking off and eating our turkey dinners, there are some people whose dedication to London knows no bounds. 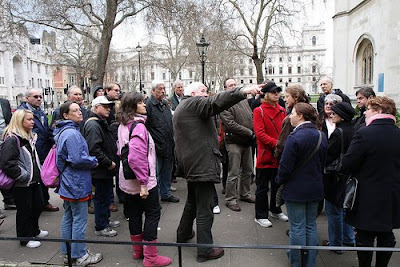 The good folk at London Walks are prime examples.They have two walks which their dedicated guides are leading even today. 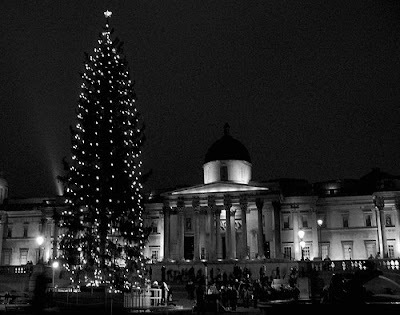 One walk goes in the morning and one in the afternoon, and both meet at the Christmas tree in Trafalgar Square. At 11am, you can take a walk titled Christmas Morning, 1660 - Samuel Pepys's London, and then later at 2pm a Christmas Day Charles Dickens's London Walk will undoubtedly evoke that Christmas Carol spirit which is usually reserved only for Hollywood. Your author takes his hat off to them. He is flying out on holiday this evening but this site will to be updated, hopefully every day. For more on the walks, see here. Your author isn't a religious sort, but if you're going to attend church at any time of the year, Christmas is undoubtedly one of the best. So today, why not attend a church service, to remind yourself of the real meaning of Christmas. A little chap who was born about 2010 years ago in a stable at the North Pole and was brought gold, frankincense and myrrh by Father Christmas. Seriously though, if you're looking for something to fulfil your religious Christmas Eve cravings, or stave off your feelings of guilt over non-attendance over the past year, then St Martins in the Fields is an excellent choice. 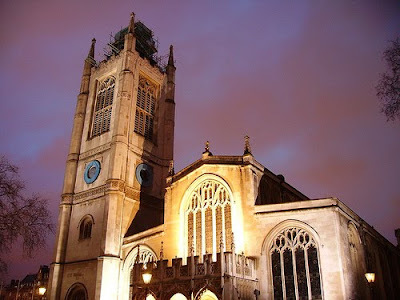 This evening they have a Parish Carol Service at 6.30pm and Midnight Mass at 11.30pm, and you can make sure you give generously to collections for Connection at St Martins, which does sterling work for homeless people at this time of year. 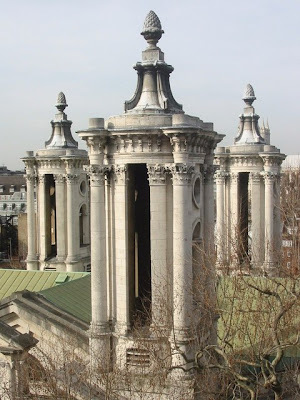 For more on all upcoming services at St Martin's in the Fields, see here. For more on Connection click the link above. As anyone whose parents sat them down in front of Blue Peter as a child will know, Norway have given the people of London a Christmas Tree every year since 1947, in thanks for Britain's support the Second World War. This year's tree is as good as ever, standing over 20 metres high and hand-picked from the forests around Oslo. It will remain in the Square until just before the Twelfth Night. 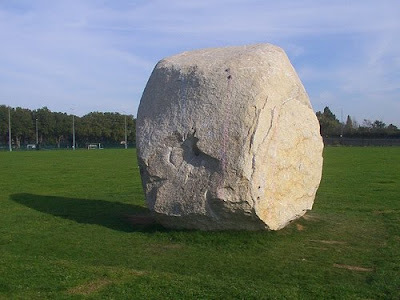 The Mabley Green Boulder, in Mabley Green, Hackney Wick, is one of two large boulders placed in East London parks by Artist John Frankland. The sculpture, which is a big bit of Cornish granite, was added as part of the Hackney Wick Festival in September 2008, by Core Arts. Nowadays, some climbing-fans see it as a challenge, and like to climb it. There have even been professional climbing classes held there in the past. Unless you're experienced, your author feels duty-bound to suggest you don't climb it, and just have a nice look at it. You climb very much at your own risk. In the Cotswold Inns of your author's youth, Bar Billiards tables were plentiful, but in many areas of London, they have long since been replaced by quiz machines and big-screen TVs. That's why your author is a fan of the Owl and Pussycat, on Redchurch Street in Shoreditch. Despite a recent minor refurbishment, it has retained the table and most of its character, and in a land of haircuts and posing your author is thankful. Bar Billiards is a particularly British game, though it is derived from a Russian game and there are various European versions. It began here the 1930s, and tables were made by the Jelkes company of Holloway Road in London and sold to pubs around the country. It became very popular in pubs without room for a proper billiards, snooker or pool table as an alternative to the local snooker club. The rules take a bit of learning, but there is a rules guide, and once you learn them it is great fun. If any readers have spotted any others in London pubs, your author would be very grateful if they could mention them in the comments. 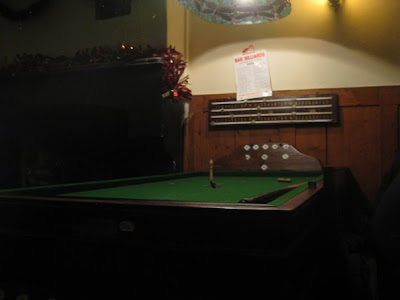 For more on Bar Billiards, see http://www.tradgames.org.uk/games/Bar-Billiards.htm or for details of the pub click the link above. A correspondent recently reminded your author of a lovely pub on the Thames, so when out for a walk in the sunshine yesterday, it seemed like the perfect spot for a light lunch. The Angel in Rotherhithe is one of the oldest public houses in Southwark, and has been recorded on its current site, with the same name, since at least the 15th century, built by the monks of Bermondsey Priory. Nowadays, it's a Samuel Smith's pub, so whilst it isn't particularly gastronomic the drinks and food are pleasantly cheap, and it is worth a visit if only to sit out on the small balcony. From here you could literally touch the Thames, and it's a great place to watch the boats and admire the unrivalled view back down towards Tower Bridge, City Hall and the centre of London. One thing that puts both the view and the pub's history in context is that it was here that Turner allegedly painted The Fighting Temeraire, the painting which was voted the greatest painting in a British art gallery and which your author mentioned last Saturday. Your author is aware that he has barely mentioned that it is almost Christmas so feels like he should pop it in somewhere. Best to avoid Oxford Street and Regents Street like the plague this time of year, but if you do feel the need to pop by there are some lights. 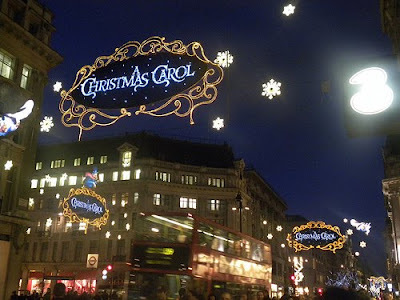 This year they are apparently themed around a re-hash of Dickens' 'A Christmas Carol', and your author is unsure if he loves that because it remembers a great literary Londoner, or hates it for the Disneyfication. Your author has mentioned St John's Smith Square previously, but yesterday he ate at the Footstool Restaurant and had a thoroughly good time. So good, it is definitely worthy of a mention here. 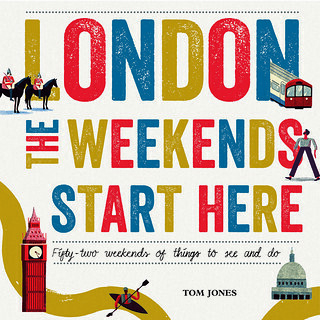 You may have notice that since your author moved temporarily to Bermondsey it is getting more of a mention here. This is because his time there is limited and it is very worthy of a mention. 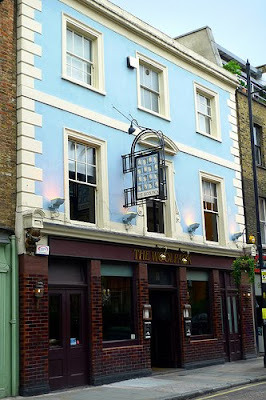 If you need proof, look no further than the Woolpack, in Bermondsey Street, SE1, a lovely pub on a street which it's easy to miss. Bermondsey Street runs all the way from Tooley Street underneath London Bridge Station but because its entrance to the North is just a tunnel it is all too easy to miss. The pub supposedly takes its name from Bermondsey's leather industry, which was very established in Victorian times, leading to the building of a Leather Exchange, opened in August 1879, which still stands today in nearby Leathermarket Street. Alongside the leather industry, associated businesses developed, including hatters who used the wool from the sheep. The Woolpack took it's name from these people. The pub is welcoming with a great interior, a nice garden and a good range of drinks and averagely-priced food, considering its location. If you've never been to Bermondsey, you could do a lot worse than start here. If you're not already finding it too cold outside, and you fancy a challenge, the Vertical Chill ice climbing wall might be up your street. Opened in 2003, the wall at the Ellis Brigham store in Covent Garden, is inside a refrigerated unit which is kept between -5°C and -7°C. It stretches 8m from the basement to the ground floor of the shop, where there are viewing windows, and offers climbing a chance to experience real ice climbing without having to travel hundreds of miles or wait for a period of intense frosts. 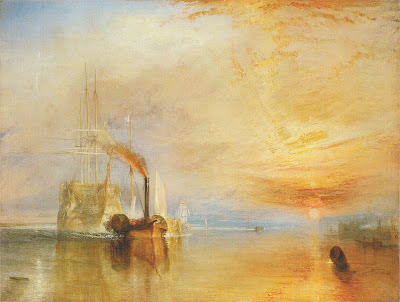 J. M. W. Turner painted a painting depicting The Fighting Temeraire tugged to her last Berth to be broken up in 1838. In 2005, The Fighting Temeraire was voted the greatest painting in a British art gallery in a poll by the Today programme on Radio 4. The ship itself was a a celebrated gunship that had fought in Nelson's fleet at the battle of Trafalgar in 1805, and the painting still hangs in the National Gallery, in Trafalgar Square. It was given to the nation by Turner in 1851. 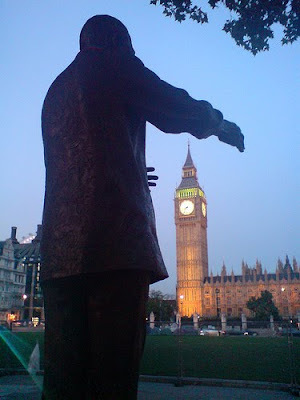 Your author was lucky enough to be present in Parliament Square when Nelson Mandela came a little over two years ago to witness the unveiling of a statue to him opposite the mother of all Parliaments. At the time, he was in the process of preparing the celebrations for his 90th birthday. He ended up deciding on a concert in Hyde Park last year, and let's hope he got a nice cake. On the day, Mandela recalled the story of how Mandela and his friend Oliver Tambo visited in the early 1960s and joked about their hope that one day a statue of a black person would be erected there, alongside that of the former South African leader General Jan Smuts. 7,000 people were present for the unveiling of the 9ft figure in a trademark Mandela flowery shirt, on the day that he joined Abraham Lincoln and Winston Churchill. Shortly afterwards, a statue of David Lloyd George arrived and debate started about whether the Square was getting too crowded. Your author thinks it is fine. 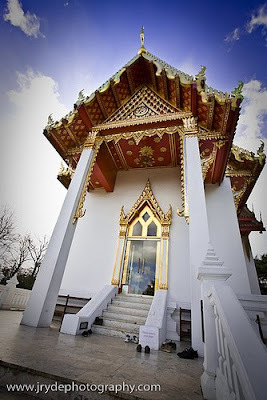 The Buddhapadipa Temple (or Wat), in Wimbledon, was the first Thai temple ever built in Europe. The temple began in Richmond in 1965 and moved to its current location on Calonne Road, in Wimbledon, just around the corner from that tennis place, in 1976. Whilst this is a working temple involved in actively promoting theoretical and practical Buddhism in London, and has become an important European Buddhist training centre, the temple and grounds are open to visitors as long as they observe the rules. They cover approximately four acres and include an ornamental lake, a small grove, a flower garden and orchard. Your author has recently moved - albeit very temporarily - to Bermondsey and felt he should mention some of the delights he has found in this area of town. One highlight of his walk to work is St James' Bermondsey, an imposing church near to Bermondsey Tube. The church was built as a result of events following the Battle of Waterloo and the 1818 Act of Parliament which was passed to raise a million pounds as a national offering for peace. 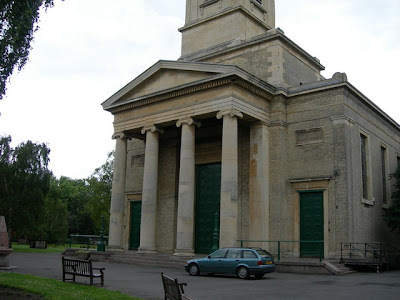 South London secured the seven Waterloo Churches which were built with the money. It was completed in 1829 and nowadays it is at the heart of the community in Bermondsey, and provides a welcome pretty view for the many flats in the new Bermondsey Spa developments. It is also still a place of worship for people of over 20 nationalities. 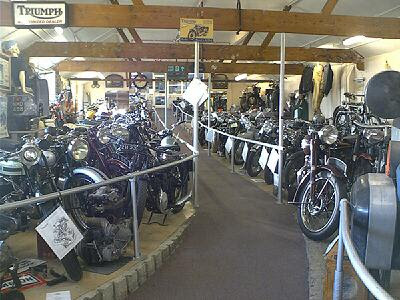 The London Motorcycle Museum, in Greenford, is home to around 150 classic and British motorcycles, with the aim of exhibiting them to the public and celebrate the wealth and enjoyment of British motorcycling history and tradition. The museum brings together motorcycles originally exhibited at Syon House, and now exhibits them in a former farm which was also used as an an Ealing Council depot. Alongside the bikes, there is a tearoom and souvenir shop, and parking is free (presumably to encourage visitors to arrive by bike). The museum is open Saturdays, Sundays and Bank Holidays from 10am - 4.30pm and admission is £3. For more information, visit http://www.london-motorcycle-museum.org/. 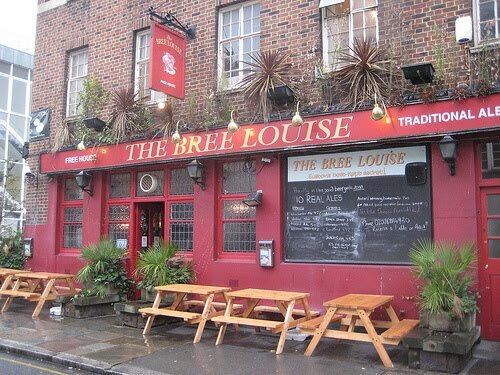 Your author has been featuring a lot of pubs recently, but there's always time for stand-out establishments, and the Bree Louise, a short distance from Euston Station, falls into that category. 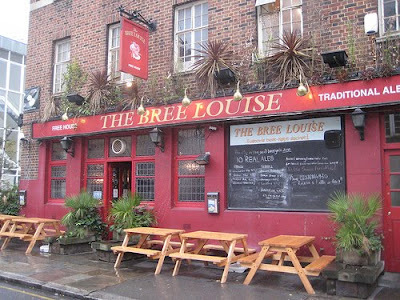 Brim full of ales and nice people, the Bree Louise is run by Craig and Karen, who have extensive experience dating back to the 80's and a great passion for pubs. Their experience really shows here, with excellent food on offer and a great range of ales, which surpases the selection in your local and gives it the feel of a perpetual beer festival. It's a perfect pub and there is even often discount for CAMRA and NUS members. Not only that, but there is a good food menu and a "pie of the day" with mash and veg for as little as £5. 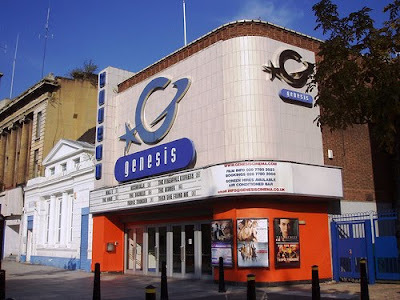 It may not look that historic from the road, but the Genesis Cinema, at 93-95 Mile End Road, E1 stands is built on a site used for entertainment for over a century and a half. It was first opened in 1848 as a music hall, and by 1912 it had been renamed the Mile End Empire and was being used as a cinema. By 1921 the Empire was owned by A. Goide & Partners who operated several East London cinemas. It's been through many incarnations since then, operating for some time as the ABC Cinema. 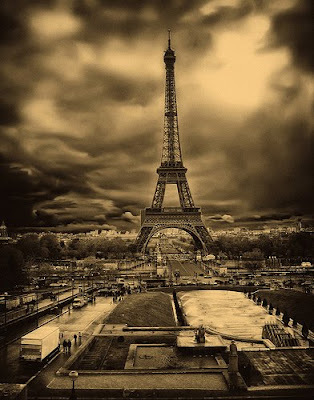 Today, it retains its large auditorium, which is particularly large and is an atmospheric place to watch a film. Sat beside one of the most famous churches in the land, Westminster Abbey, is a smaller church with just as much history. 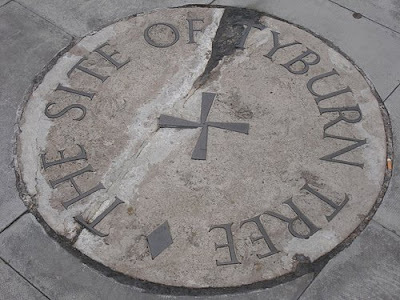 Originally founded in the 11th century by the monks at the Abbey so that local people who in the area could have somewhere to worship separately, it has been rebuilt a few times, most recently in 1523, with restorations taking place in the 18th, 19th and 20th centuries. 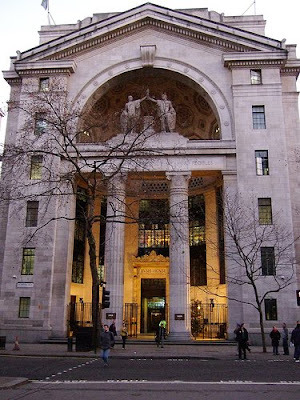 It is notable for its stained glass, as the final resting place of William Caxton, Britain's first printer, Sir Walter Raleigh and the poet John Milton, and also as the venue for the marriage of Samuel Pepys and Sir Winston Churchill (not to each other). The 50s American bowling alley theme is spreading. It started in Bloomsbury (or actually maybe in North America) and it spread to Bayswater in mid-2007 and Brick Lane in November 2008. 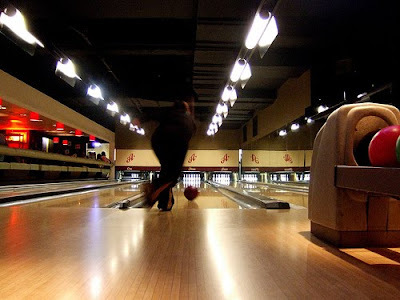 All Star Lanes is all about the look from the uniforms to the 'authentic' displays on the walls. It's just as authentic as when your author first went ten pin bowling on an airbase in South Gloucestershire in the 90s, but these guys know what they're doing and do reasonable food and drinks that are a little expensive but not hugely so. Bowling costs £8.50 per person per game on peak and £7.50 off peak and if you're lucky enough to be a student still they do student Sundays where you can have a burger, a beer and a bowl for £15 at the Holborn branch. There's also karaoke at the Brick Lane one and you can even buy one of the staff's uniforms to take home if you love it that much.